Get a special rate by booking online (booking required 48h in advance)! 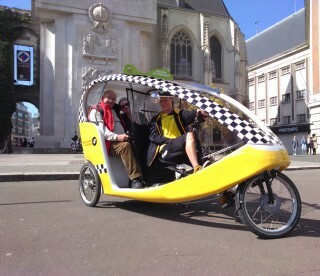 This new tour, developed in collaboration with the Happymoov company, offers a guided audio-video tour by bicycle-taxi. 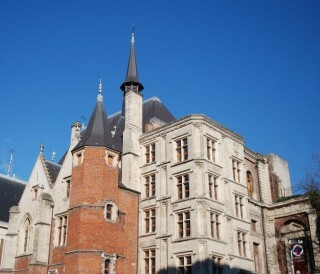 Since the Rihour Palace, visitors will discover on their pad History of Lille, from the origins of Isla to contemporary times. Lulled by the charm of this new mean of locomotion, they will imagine the crowd of merchants on the Grand Place and around the Old Stock Exchange in the seventeenth century, will be surprised to learn that the building of the Opera and the chamber trade is due to the same architect, and many other discoveries will still ... Ilot Comtesse, Citadel, Palais des Beaux-Arts, Belfry of Lille City Hall will parade before their eyes, before returning place Rihour. 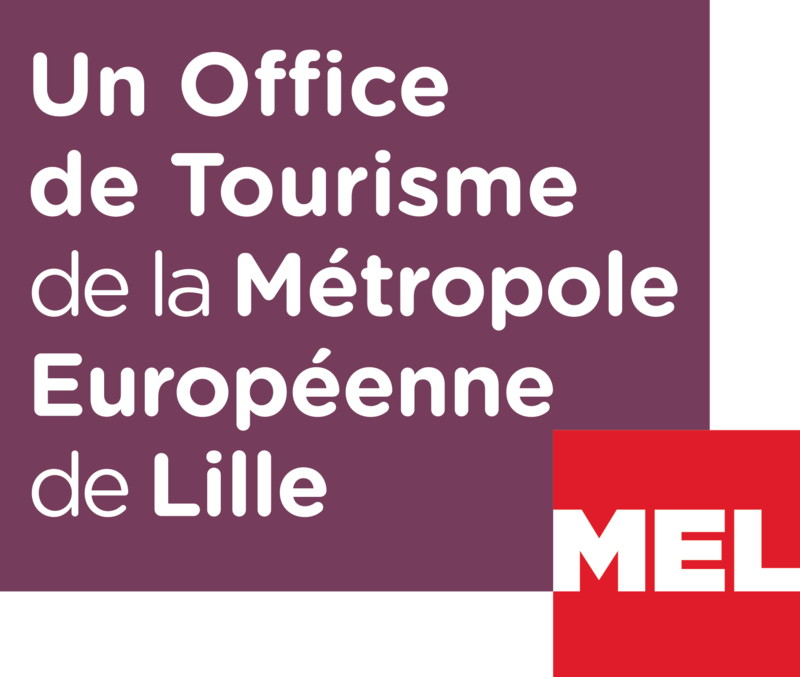 Visit in French or English. Rental is the vehicle (not the person). Warning: an ID will be required in exchange for the loan of the digital pad. This tour is not recommended for pregnant women and people with back pain. 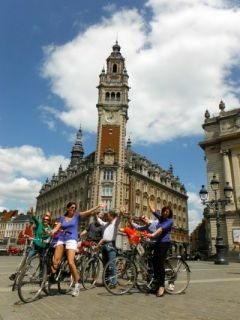 Discover Lille on authentic and flowery Dutch bikes (or tandems) as in Amsterdam! 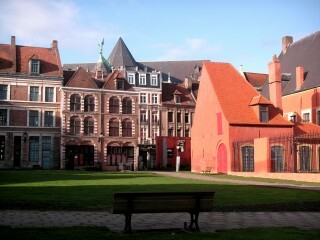 The tour lasts about 2 hours and allows you to discover the main sites of Lille and its history on "Lille at the water's edge" theme. 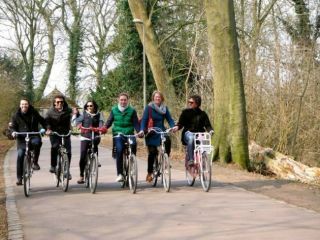 Your cycling guide will show you what he likes most about his city, and sometimes overlooked corners on a course consisting of approximately 10 stops for comments. 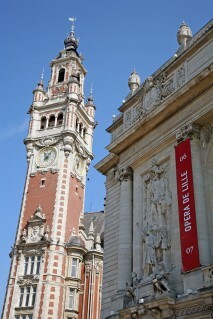 With this tour, le Grand Huit offers a great way to discover Lille fun and relaxed! 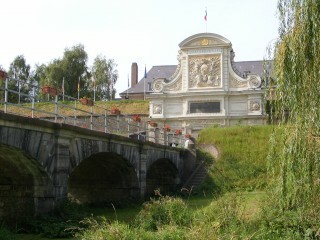 Visit possible in English and Dutch depending on availabilities. Get a special rate by booking online! 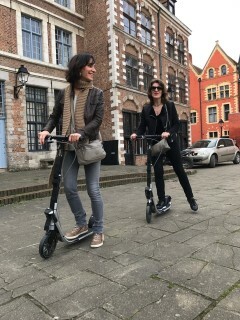 Casual visitors, simply curious or History lovers, Tradi'Balade is the ideal unusual tour to discover the beautiful city of Lille ! 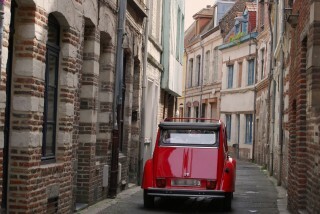 Both friendly and cultural, our surprising 2CV tour, lead by our driver-guide, enable you to live an unforgetable experience in a friendly and pleasant atmosphere. 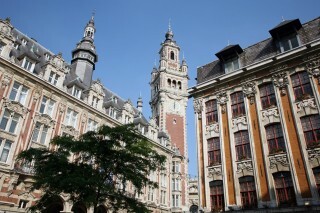 During this tour you will discover anecdotes of the monuments, the streets of Lille, the History and Architecture of the city. 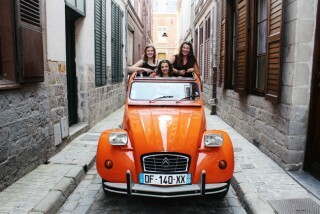 You will be welcomed by our team of private and friendly chauffeurs-guides, with good knowledge of the 2 CV and the town. The cars are convertible. 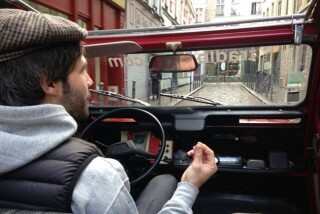 The course is thought to optimize the tour and explore the narrow streets of the old city. 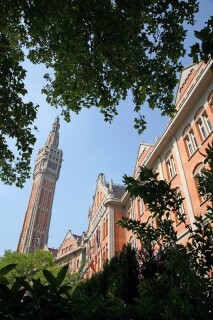 Planned downtime for photos in charming streets of the old Lille. Visit in French or in English. Online booking is not possible for the same day; you can contact our team by phone at +33 (0) 359 579 400. Please note that the tour schedule may be subject to change for bookings within 24 hours. The North, Beer Region? Certainly. So the beverage has left its mark on the whole territory. 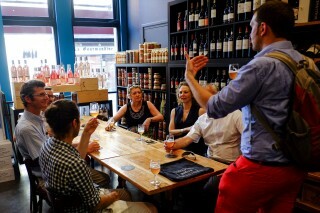 This is a guided tour of the city of Lille: show the past and present footprint of the brewing culture and industry in the city of Lille (remnants of old breweries, new micro-breweries, beer bars, history of beer in the North and anecdotes about beer in Lille ...). The goal being to explain how the brewery culture has marked the territory, thanks to the explanations of our guide. Two stops "tastings commented" by your guide are provided in 2 bars on the course. Possibility to consume soft drinks instead of beer. 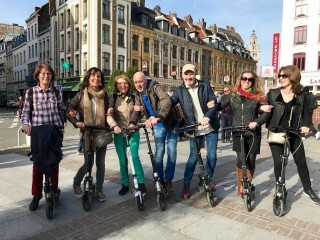 Meeting place: in front of "Lille Flandres" station, near the restaurant "Les 3 brasseurs"
It's cool to visit Lille by scooter. And it's original. It makes you want to ride the scooter. Without getting tired. It is easy and accessible to all. 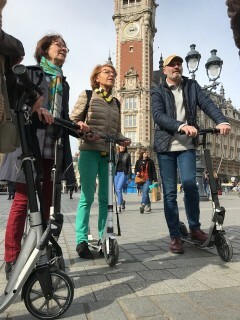 Share a fun, participative moment, animated by a friendly guide who will make you discover the city and ... the scooter! 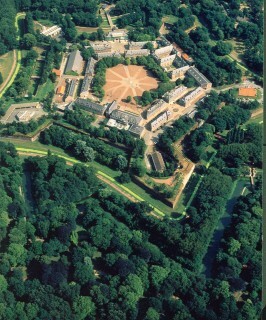 Possibility of visiting with family, with children, parents and grandparents, but also between friends or colleagues. The scooters are of course provided, with suspensions even! The guide begins by explaining to the group the adventure you will experience. 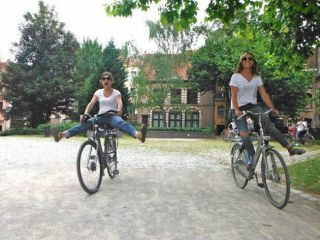 It helps to take good care of the scooter and find the right postures. 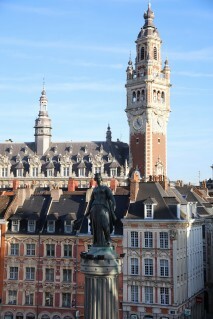 You will discover the center, the Old Lille and its history, but also the modernity of Lille Europe. You make a dozen stops with comments and photos. You have challenges to face! Gymkhana, competitions of elegance, improv, and various games with the scooter: beautiful laughs in perspective. 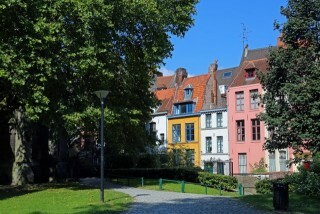 Your guide takes a lot of pictures, in Old Lille but also in front of the tulips of Lille Europe or the frescoes of Jean Patou! You can find them the same evening on the Facebook profile with your agreement.